Camera manufacturers frequently produce charts of sensor gain, read noise and dynamic range for their cameras. Such charts are useful for comparing the characteristics of one sensor with another and also for helping choose the optimum camera settings for a particular imaging situation. However, until now, creating these charts was outside the reach of all but the most dedicated amateur astronomer, requiring as it did dozens of careful measurements and careful calculation. SharpCap now automates the measurements and calculations required to perform this analysis on almost any camera (DirectShow cameras cannot be analysed because they do not have a fine-grained exposure control that SharpCap can adjust). The results of the SharpCap Sensor Analysis procedure are used to support the Smart Histogram functionality that helps guide the choice of gain, exposure and bit depth when imaging. These are the steps you need to carry out before running SharpCap’s Sensor Analysis tool. · Find a source of constant illumination. o Natural daylight on a clear or overcast day is ideal, but not on a day with scattered clouds as the brightness changes. o Using your telescope, putting it out of focus and pointing it at the cloudy or blue sky or putting a white T-shirt or similar over the lens. o Using the camera with no lens or cover (but beware getting dust on the sensor). · Set any colour balance, gamma or contrast controls for the camera to their ‘Neutral’ state. To begin the process, select Sensor Analysis from the Tools menu. Any existing tool (such as the Histogram or Live Stacking) will close and the Sensor Analysis will open. The selection area rectangle will also appear in the image preview area. 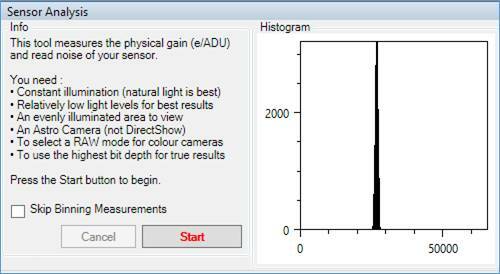 Some basic instructions and a small image histogram will show in the Sensor Analysis tool window. Only check the Skip Binning Measurements checkbox if sensor analysis has failed or become stuck at the final stage of measuring the effects of binning in a previous run. Once you have checked you are ready, press the Start button. Once the Start button is pressed, SharpCap will automatically select the highest gain level that will be tested during the sensor analysis (this may not be the highest gain that your camera supports – some cameras have a very wide range of gains, in which case the highest gains will be excluded from analysis to make the process more reliable). SharpCap will also automatically adjust the camera exposure to correctly expose the region inside the Selection Rectangle. At this point you should adjust the move and/or resize the Selection Rectangle to select a region of the image that is of uniform brightness and colour. 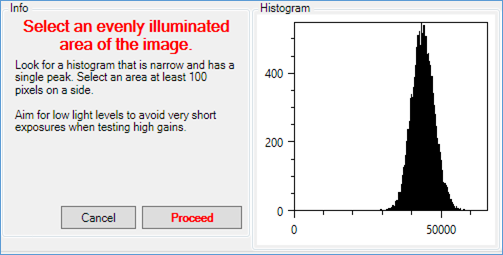 A suitable area of image will show a histogram similar to the one below with a single, symmetric peak towards the right-hand side. You should also adjust the brightness of illumination to give an exposure time just over 1ms (unless SharpCap recommends a higher value). Do not adjust the exposure value yourself – it will be automatically adjusted as you change the illumination levels or adjust the selection area. If the selected area is not uniform then the histogram will have more than one peak or an asymmetric peak. If the exposure time is too long or too short then a warning message will be shown in red giving instructions on what changes need to be made. Both of these situations are shown in the image below. Once the light levels have been adjusted correctly and the selection area chosen, press the Proceed button to start the actual measurements. · Allow the light level reaching the camera to change (except when asked to cover/uncover the sensor). The first stages of sensor measurement involve measuring the true bit depth of the images that the camera produces and the e/ADU (electrons per ADU) of the camera at minimum gain. While the e/ADU measurements are being made a scatter graph will draw to the right of the histogram which shows the relationship between measured frame noise and measured mean ADU at various exposures. The green crosses should be close to a straight line. After this stage is complete, the sensor must be covered so that no light can reach it to allow dark measurements to be made. SharpCap will prompt you to cover the sensor to allow dark measurements to proceed. SharpCap will set a high gain and a 100ms exposure which will most likely lead to a white image showing on screen at this point. When you cover the sensor, the camera image will go dark and the Proceed button will become enabled. Press the Proceed button when it becomes enabled and the sensor is fully covered. A large number of dark measurements need to be made, but they typically proceed fairly quickly unless the frame rate is very low. The initial measurements are of the brightness of the image with different values set for the Gain and Offset controls (Offset is also known as Black Level or Brightness). 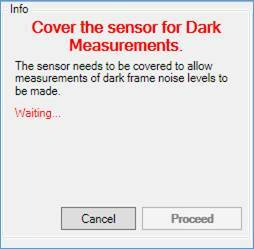 These are followed by measurements of the amount of noise present in dark frames at various gain values. When the dark measurements are complete, the sensor must be uncovered to allow the final Gain and Binning measurements to take place. SharpCap will prompt you to uncover the sensor. Once you uncover the sensor, SharpCap will begin to adjust the exposure to correctly exposure the selection area. At this point, you may (if required) adjust the brightness of illumination and the selection area as you did initially to ensure the area being measured is uniform and the exposure is in the recommended range. Once any necessary adjustments have been made, press the Proceed button, which will become enabled when the sensor is uncovered. 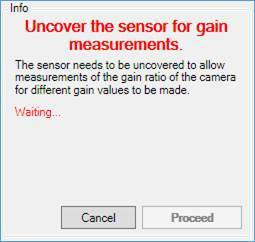 After you press the Proceed button, the final stages of sensor measurements will commence, which involve gradually adjusting the camera gain and measuring how much the exposure must be changed to counteract each change in gain. It is vitally important that the brightness of illumination of the camera does not alter during this part of the measurement process, otherwise incorrect results will be produced. The final step is to briefly adjust the Binning setting of the camera to determine how the camera deals with binning, after which the results will be shown. · The sensor bit depth, shown above the results table, here 12 bits meaning that the sensor can produce 212 (4096) different ADU values (different brightness levels). · The Read noise of the camera for different gain settings, shown as the red crosses on the graph and in the results table. This is the amount of noise (in electron equivalents) that is added to each image due to the camera electronics not being perfect at reading the brightness of each pixel. · The Full Well capacity of a pixel – that is the number of electrons that it can hold before it becomes saturated (gives a 100% white signal). · The Dynamic Range for each gain setting – this is the ratio between the brightest signal that can be properly measured (the full well signal) and the dimmest (the read noise). This value is measured in photographic stops (effectively powers of two). Usually, the graphs will show two smooth curves, with the highest values for both e/ADU gain and read noise at the left-hand side. The example above shows a sharp drop in the read noise at a gain value of approximately 200. In this case, the camera sensor switches to a more sensitive and lower noise mode when the gain is higher than 200 and this is reflected in the measurements. SharpCap stores the results of completed Sensor Analyses on your computer and will use them later to provide Smart Histogram functionality on analysed cameras. If you re-run the analysis then the previous saved version will be overwritten. Note that previously saved sensor data will not be shown when you re-select the Sensor Analysis tool. It can however be viewed in one of the tabs of The Smart Histogram Brain Window. 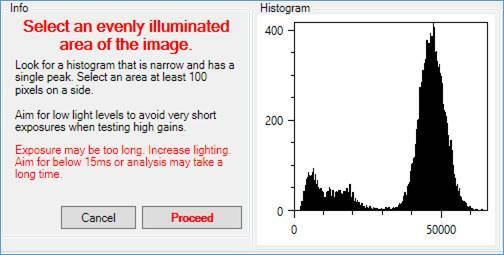 To gain full Smart Histogram functionality, you should analyse your camera at both it’s maximum bit depth (i.e. in RAW12/RAW16/MONO16 mode) and at a bit depth of 8 bits (i.e. in RAW8/MONO8 mode). Sensor analysis is a free feature and does not require a SharpCap Pro license, however users with a SharpCap Pro license can copy the table of values from the results if they wish.